Many Salesforce users don’t like the ongoing juggling between Salesforce and their email account. We have some good news for you! Salesforce has launched an configuration integrating Salesforce with Outlook and Gmail. This configuration make sure all the emails you send from Salesforce are all so saved in your ‘Sent Items’ in your Gmail/Outlook account, which means you can stay in Salesforce, send all your emails, and still have all your emails saved in one place! Opportunity and other info directly through you email account. You can work using your email account while having all the information you need from Salesforce. Einstein Activity Capture integrates your email calander and messages with Salesforce. You can have everything you need in one place! You can see past messages and future meetings with your potential clients on Salesforce. This is a two-way feature, meaning that you can see events set on Salesforce on your Outlook or Google account. 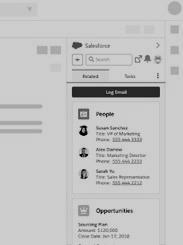 Einstein Activity Capture makes the email, calander and Salesforce integration both simple and effective. Enterprises, giant financial empires and even your local flower shop – they all tackle problems as they come. There is no operation which is perfect, and everyone face obstacles on their way. Good news! You don’t have to be discouraged, you just need to take action and prepare better. Meet NetSuite – your new guide for a better, smoother, and more beneficial future. Running a business is tough. There are various departments, numerous employees and a huge room for error. In order to run any business successfully, you need to be on top of it all, acquiring and analyzing information from both the outside markets, and within the corporation itself. Most businesses, at least up until a few years back, had to solve every problem that occurred in motion. A problem appeared? A solution was needed. Businesses who managed to assign personnel, resources and time? Got to grow steadily. Those who could not afford the retaliation of the hurdles on the way? Crumbled and failed. The meaning of this is fairly simple – small businesses have less chances to survive in the market. But since then we have developed, evolved and made it possible to improve on our own problem-solving skills. It is time for you to learn how. Early bird gets the worm – use NetSuite to predict future problems! To understand how NetSuite’s systems, operate and benefit you, we first have to understand what “ERP systems” mean. To manage a business successfully there are a lot of pieces of data which you will need to take in consideration to see the whole big picture of the market, and your place in it. Data from sales, human resources, customer relations and many more have to all go into account in order to maintain a corporation. Managing this much data alone is inhuman, and if we are honest, impossible. That’s where ERP systems come in for the rescue. Enterprise resource planning systems gather all the necessary data from your corporate’s different departments, analyses it and grants useful insights. Netsuite does exactly that, and enables you to predict future hurdles for your operation, and avoid them before drastic impacts occur. Most ERP systems offer you basic analyses through constant feeding of information from every department. In order to feed the information in the system you need to invest personnel and resources so to get clear and useful data. But why should you work for your system, when your system can work for you? NetSuite’s cloud ERP is the solution for this problem. It operates on cloud services, gathering data from all department in real time and supplies you with the analyses quickly and efficiently. Connect all departments through the cloud, and let it work for you – not the other way around! NetSuite developed its systems in order to optimize your working process, and business. Its adaptive nature allows you to connect NetSuite’s ERP to your own already existing systems, and integrate with the CRM systems which you presently use. NetSuite automates all your business processes across sales order management, purchasing, manufacturing, inventory management, shipping and invoicing, which helps you optimize your work in every field and sector so that you can be sure that you avoid possible disruptive outcomes, problems or hurdles, and better your business model as a whole. NetSuite is the leading cloud-based ERP product on the market today, and you deserve nothing but the best. Take matters into your own hands, work better, and help your business grow even further. Contact us today to start working with NetSuite as soon as possible, and as effectively as possible. As a financial controller, you are expected to bring strong value to the organization and it is all about the tools at the end of your fingertips. Netsuite is the rock star of all these tools as it provides both a 30,000 thousand feet helicopter view as well as a deep dive into the details on the transaction level. Take your organization to the next level! There is no doubt that the new and surprising partnership between Google Cloud Platform and Salesforce will have a great impact on the world of cloud services and on CRM particularly. Mainly, it would substantially benefit the customers of Google and Salesforce and emerge as a force multiplier for both corporations in the cloud domain. Their customers would get a more comprehensive picture of their data residing within Salesforce, Gmail, Drive, Hangouts etc. In addition, it seems like the new partnership is already making difficulties for Salesforce and Google’s competitors who would have to create better technology and better services if they want to stay in the game. We think that it will take a few months before we realize and understand the great impact of that new partnership. We at iCloudius are very excited about this new partnership, and wish Salesforce and Google the best of luck!